A wardrobe and sideboard for the centre of the room. Air is a small family of furniture for storage purposes that combines a graphic pattern of white ribs with natural cane inlays, giving a feeling of lightness and transparency to items of furniture that often seem heavy and difficult to place in the room. Air can be used as freestanding room dividers or placed against a wall. Woven cane gives a visible surface, but also provides a sense of depth. One can guess at what is hiding in the cupboard without this being irksome. The fact that the designs are transparent also fulfils a function. 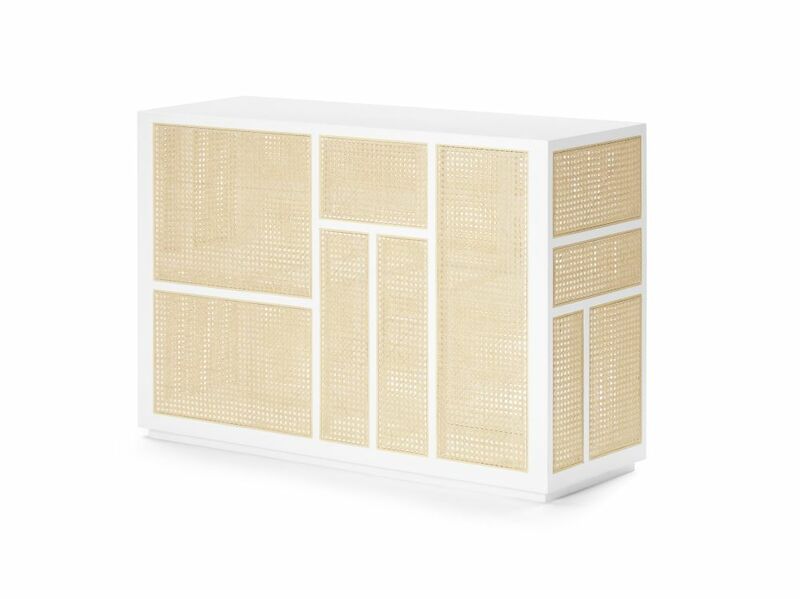 The woven cane ventilates the cupboard which is practical when storing both clothes and electronic devices. With his mix of Swedish and French roots Mathieu was tempted to pair the Swedish attitude to furniture with that of the French. Air is given a unique personality through the mixture of a refined, blond and airy Scandinavian idiom with a touch of French style and elegance as well as the use of cane, which one would hardly expect in such an item of furniture. It is through exceeding the usual boundaries in this way that Scandinavian design is renewed and this is one of many reasons why Air has a natural place with Design House Stockholm. Mathieu Gustafsson has his roots both in Paris and in the Swedish province of Småland – the heart of the Swedish furniture industry. It is from differences and similarities between the two cultures that Mathieu fetches much of his inspiration in a creative process that, as far as he is concerned, often starts with becoming aware of a need or a way of behaving rather than with an object as such. Professionally, Mathieu has a background in graphic design, furniture making and furniture design and he currently runs a design studio at leading Swedish architectural practice Tengbom, focusing on furniture and industrial design. He is also creative director for furniture manufacturer Grand.